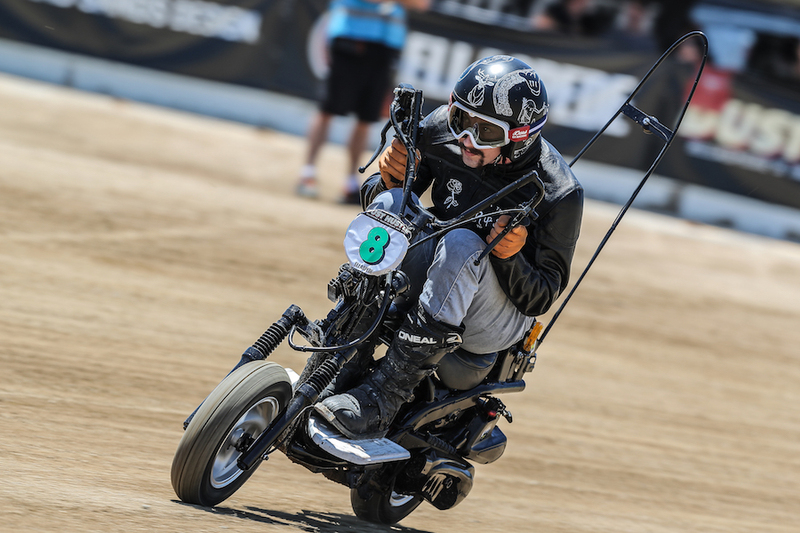 Got a rigid Harley, a 750cc café racer or anything else that shouldn’t be on a pro dirt track? Bring it here and ping it! Dust Hustle. 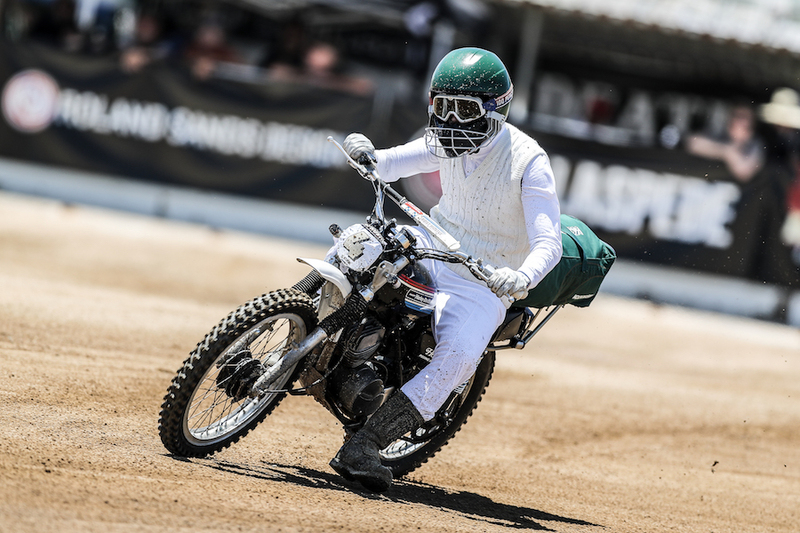 It’s Australia’s answer to the now-global DirtQuake where hipsters, celebrities and folk who just love their roadbikes get all senseless and sideways on dirt flat-track ovals. 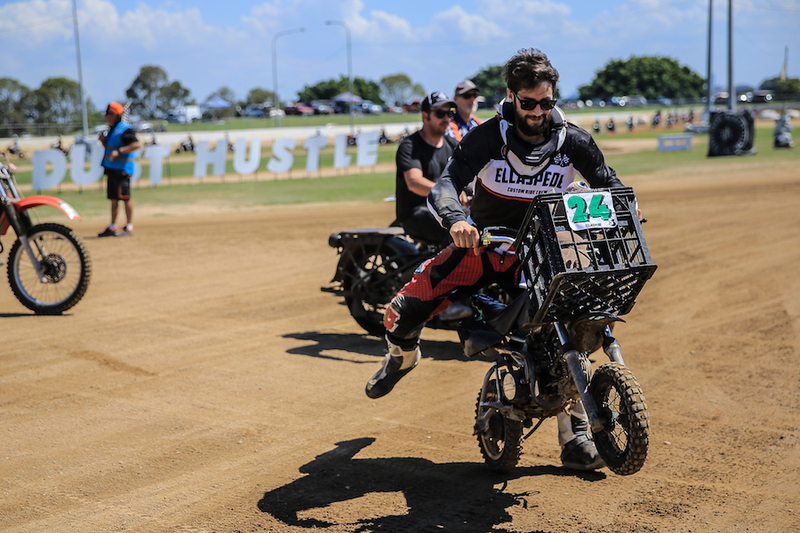 Now into its fourth year, Ellaspede’s inappropriate day on the dirt returned to its traditional home at Mick Doohan Raceway in Brisbane’s north for Dust Hustle 5, after the fourth instalment was held at the Queensland Vintage Motocross Club’s compound at Biddadaba back in April. 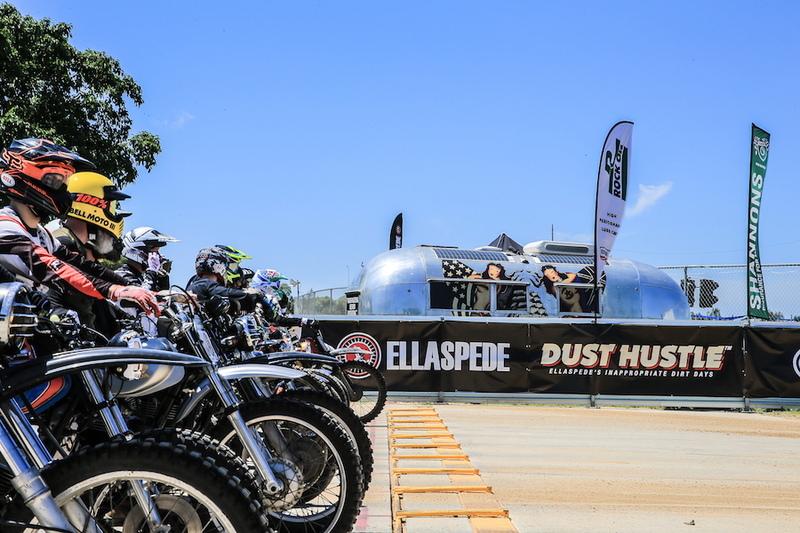 Since 2014 the Dust Hustle has stood in defiance of an ever-encroaching Nanny State hell bent on legislating the fun out of anything motorised. Go as hard or as easy as you want. You can putt around the pole line or let it all hang out in the loose stuff; it’s your prerogative. It’s the Dust Hustle way. But if your ambition gets in the way of your ability and you take a dirt sample, there’s a huge crowd to cheer you on, paramedics on standby, and enough photographers to guarantee multiple angles of the moment you ran out of talent. 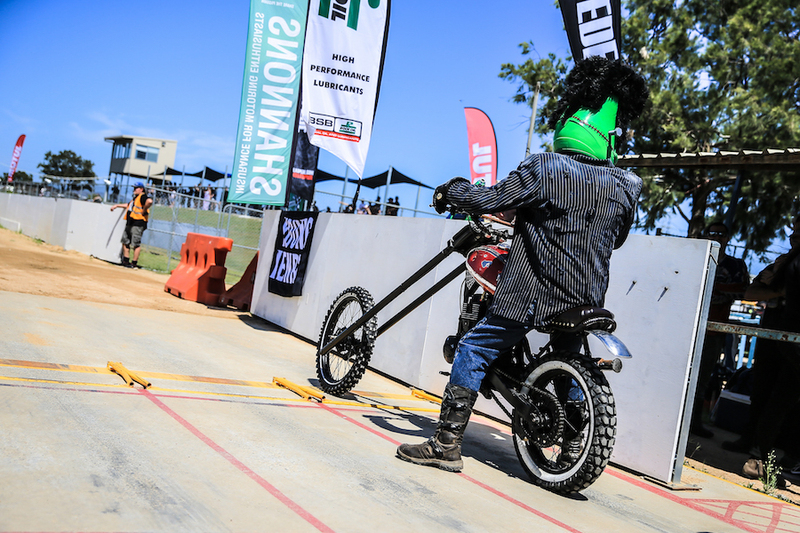 While the event has grown commercially, it still feels like you’ve snuck on to a racetrack with a bunch of mates; only now there are a few thousand spectators, food and beer trucks a-plenty and a mini-industry trade show bustling around you. It isn’t a complete free-for-all, there are at least a few rules to abide by. 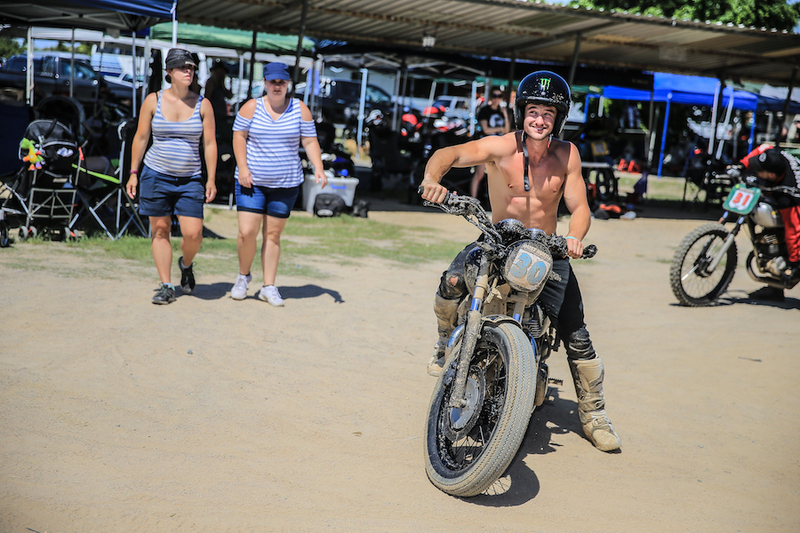 Most importantly, you can still ride almost anything that’s completely inappropriate for dirt track. Bikes are separated into somewhat sensible categories; Clutchless Scooters & Posties, Risky Road Bikes, Old Mates (pre-1990), and Enduro/MX. Safety gear is not negotiable, there’s no drinking until you’ve finished riding for the day and there are no sportsbikes allowed. Two different track configurations were used during DH5, with the morning track featuring doglegs on both the front and back straights, creating a tight hairpin which really tested out the bigger bikes. The afternoon’s layout featured a faster, more flowing configuration that used the long-track front straight for those wanting to really wind it on. Where else can a weekend warrior pit their daily commuter next to Nitro Circus stars Harry Bink and Matt McFerran and borrow a spanner? Or chew the fat between rides with Mr Motocross legend Stephen Gall, or former world endurance champ Steve Martin? Or watch a Ninja Turtle have a go around the outside of three-time world Speedway champ Jason Crump? Every skill level is represented, from all-road dirt virgins, bush bashers to veteran flat trackers and speedway riders who only know how to turn left. One of the most impressive rides though was from Gympie teenager Jarred Brook, who swapped his KTM RC390 and 450F for a Moto Guzzi V7 III Stone. Humble to a fault, Brook was the first Australian and still the only foreign rider ever to win the prestigious AMA Nicky Hayden Horizon Award as the most outstanding amateur racer in the US. Within a couple of laps, Brook was sliding the 210kg 750cc Italian streetbike effortlessly through the entire speedway section of the track. The V7III was completely stock (with the exception of an Arrow exhaust), and it only required a few tweaks to get it sideways on the shale. 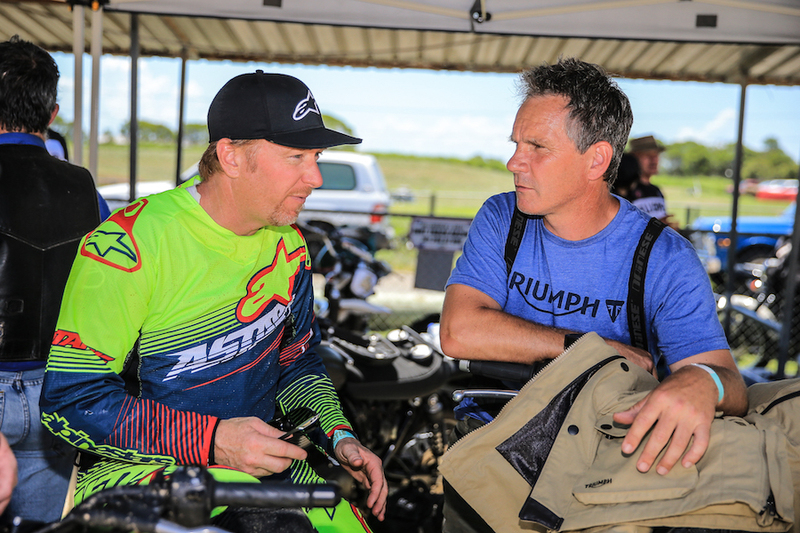 “We just firmed up the rear suspension a bit and once I adjusted to how different the Guzzi was to what I usually ride, it was all good and we were away,” said Brook. 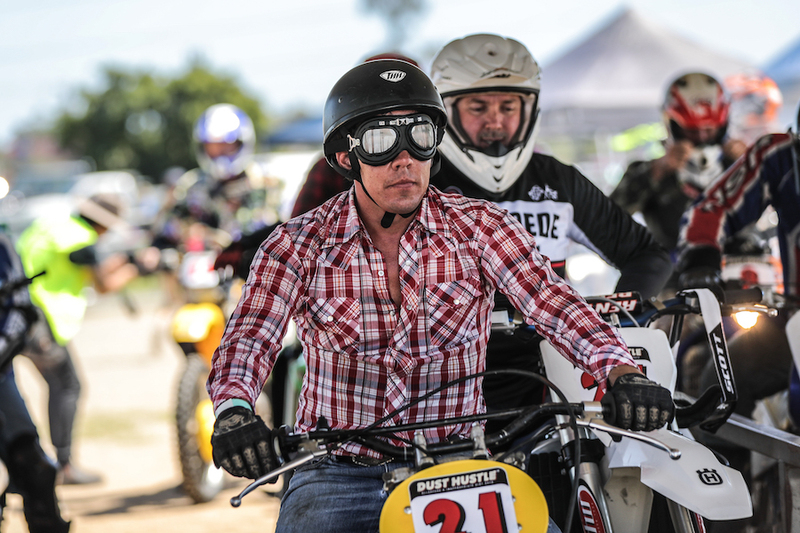 Brooke, Mick Kirkness and 16-year-old Max Whale – all with AMA Flat Track experience – were part of the lunchtime pro demo races, with Brook jumping back onto the Moto Guzzi for a couple of head-to-head shootouts against Steve Martin on a Triumph Street Scrambler. Crumpy scorched around on a GM long-track slider, while Stephen Gall’s demo on the dystopian dual-saddle, 22-inch swingarm Mad Max Yamaha YZF-R1 Vuvalini blew minds. The biggest endorsement of how much fun there is to be had at this event, is the number of professionals who are lining up to come and ride. Icons of Australian motorsport who have done it all (people who could be forgiven for being a little jaded) are among the most stoked faces in the pits; no appearance money, no red carpets, just a fun day getting loose with mates new and old. 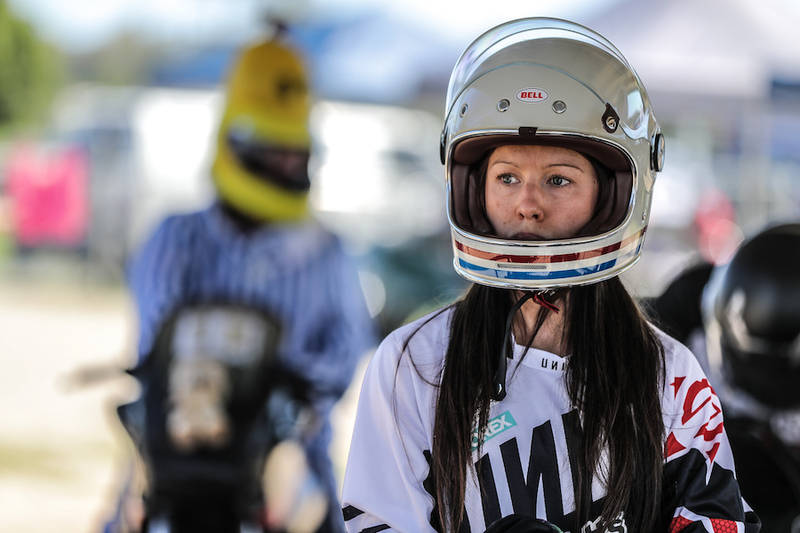 There’s no gender-based discrimination here, with ladies making up a significant proportion of entries and accounting for some of the most talented and accomplished riders on the grid. Yamaha enduro star Jemma Wilson took to flat track like the proverbial duck, Freestyle Motocross gun Emma McFerran was bombing it around on her Honda CB250 café racer, Briony Hendrickson beat most of the boys during the lunchtime pro demo show and JoJo Fitzgerald added some glamour with one of the coolest rigs of the day, a rare 1973 Spanish Ossa SDR 250 Enduro. The toughest hustler of them all though was Gold Coast local Natalie Young, who made her made track return on a Triumph Bonneville after breaking her neck at Dust Hustle 4. You’ll get more riding sessions at the Dust Hustle than your forearms can handle. With fatigue setting in and the call to imbibe growing louder from the well-stocked bar, numbers on the grid started to dwindle late into the afternoon session. In a moving tribute at the trackside after-party, Hughan Seary from Ellaspede announced crowd favourite Dwayne “Frankenchopper” Amore as the obvious choice for the Broomy’s Best on Ground award. 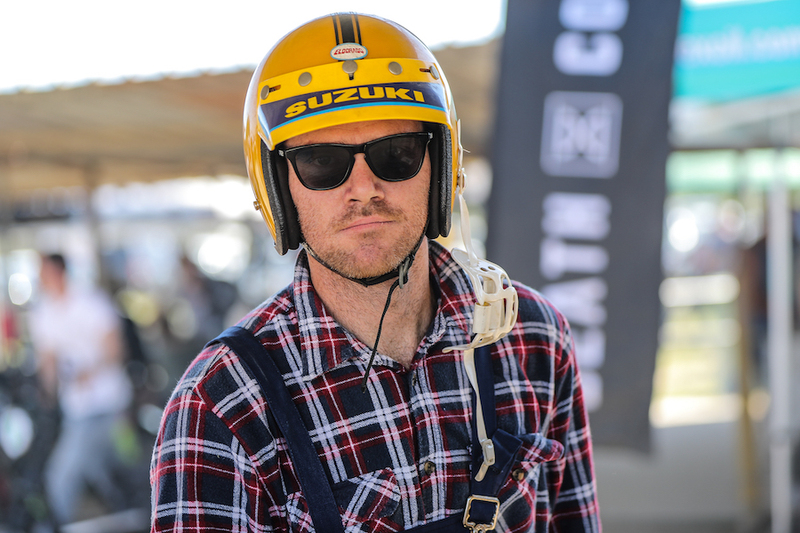 The coveted award is named after Adrian Broom, the stand-out at the inaugural Dust Hustle event who went to extraordinary lengths, shipping a bike to Brisbane to take part in the DH1 event. Dust Hustle 6 has just been announced for 21 April this year and believe me when I say you should do everything in your power to get yourself there.